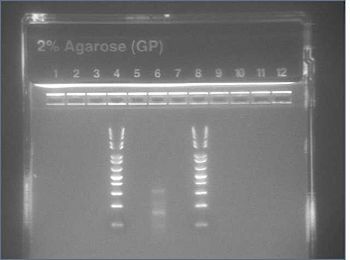 Yesterday, we plated transformants for the allergen panel and introns. Today, we will purify the plasmids from the transformants and send any successes in to Genewiz for sequencing. 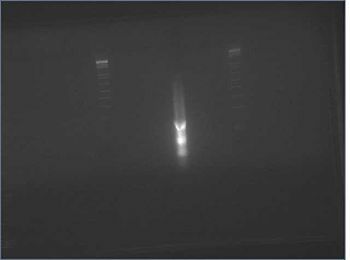 Ran 2% E-gel of .5μL of the ligation reaction (2.6μg) in 15μL water, with 10μL of KB plus ladder on either side. 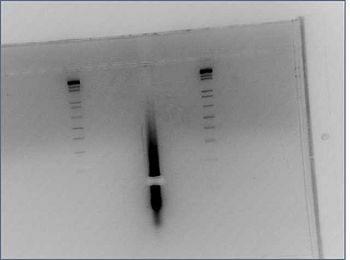 poured 2% agarose Gel for gel extraction, ran 2μL of the ligated annealing reaction in 13μL EB buffer, with two KB plus 1 ladders, one on each side. 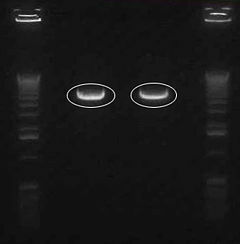 Nanodrop for cleaned-up gel purified 5xGalpt negative - ran a 2% E-gel to check. There appears to be something at the .16kb size. We ran a confirmation digest on the miniprepped Miraculin N StrepII & Stop and the Brazzein C StrepII & Stop. 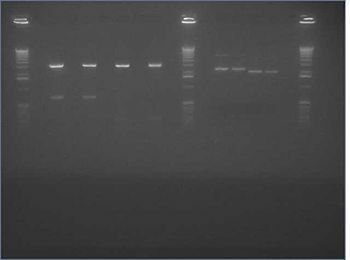 We digested the samples with XbaI/PstI. We should have used NotI/SpeI in this digest if we planned on inserting into V24 pETDUET vector. 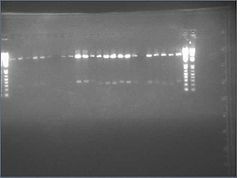 We digested 558 ng of Mira N1, 516 ng Mira N2, 540 ng Brazz C1, and 551 ng Brazz C2 in 20 μL digestion reactions. We also ran undigested samples of all four to help determine why the other ligations (Brazz N and Mira C) did not work. We ran 279 ng of Mira N1, 258 ng Mira N2, 270 ng of Brazz C1, and 275.5 ng Brazz C2. 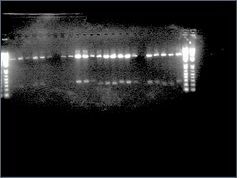 Gel shows bands consistent with successful ligation! Gel extraction and purification of Miraculin, StrepII & Stop insert and Brazzein, StrepII & Stop insert. The pETDUET Expression Vector, V24, was digested with Not1/Spe1 for later use. This page was last edited on 26 September 2017, at 19:18.